2015 was an enormously frustrating Cup of Nations for Senegal. After getting off to a winning start with a 2-1 win over Ghana, complete with a last minute winner from Moussa Sow, it looked as if they were going escape from a tough group. But Ghana’s late win over Algeria, a draw against South Africa and then a defeat to Algeria in the last game saw them exit with four points, a disappointing outcome in the ‘group of death’. Nonetheless, they responded positively with a very impressive qualification campaign. They were the only team in the group stage to win every single game, although the quality of the opposition, in the form of Burundi, Namibia and Niger, could be described as questionable. Stronger tests would come in World Cup qualifying, where they defeated Cape Verde before losing for the first time in a competitive match under Aliou Cisse against South Africa. The team is much-changed from the end of the Alain Giresse era in 2015, but Senegal remains one of the African team most blessed with talent. While it doesn’t quite have the sheer number of options in attack than it did two years ago (due to the loss of Demba Ba and Papiss Cisse), it is still potent, while Mohamed Diame, who missed the last AFCON, is back in the fold in a competitive midfield. In the highly sought-after Kalidou Koulibaly, they have one of the best African defenders around at the moment. Senegal tend to stick to a 4-3-3 to get the best from their squad. Young Abdoulaye Diallo of Caykur Rizespor is the first choice goalkeeper, ahead of the more experienced Khadim N’Diaye. Kara Mbodj is the only survivor of the 2015 defence and will play at centre-back alongside Koulibaly, with Lamine Gassama and Saliou Ciss the likely full-backs. The most recent midfield combination has been Idrissa Gueye, Diame and captain Cheikhou Kouyate, all talented and now experienced at this level while Sadio Mane is a fixture in attack, likely alongside Sion’s Moussa Konate and Lazio’s Keita Balde, with the veteran Moussa Sow regularly off the bench. The defence – The Teranga Lions conceded just two goals in their qualifying campaign. While you can (and indeed must) question the quality of the opposition, that is still an impressive feat: only Morocco of the teams who played six games conceded fewer. In particular, Kalidou Koulibaly is a huge asset, while Kara Mbodj impressed two years ago, and they get great protection from a combative midfield. However, they may miss Crystal Palace’s Pape Souare, who is still recovering from injuries received in a car crash earlier this year. Yet to be tested – As with Burkina Faso, it’s hard to identify weaknesses from a team in good form against mediocre opposition. Senegal’s group in qualifying was very average, with only Niger having any record of recent qualification. Similarly, in the two games in World Cup qualifying, they won one and were unfortunate to lose to Shakes Mashaba’s South Africa in the other. It’s questionable if this is enough preparation for facing two of Africa’s best teams. They may get found out very quickly if they come into this tournament not sharp enough. Sadio Mane – More than just being the team’s most gifted player, £34 million man Mane, who is still only 24, is a vital piece of the puzzle for this team. Without him, it’s hard to see how they are going to create chances and score goals. 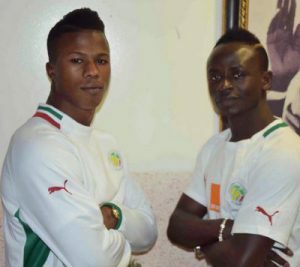 Keita Balde – The big new talent in Senegalese football, 21-year-old Keita only made his Senegal debut in March 2016 after choosing to play for the Teranga Lions instead of Spain. He already has two goals in five appearances and looks set to be a major part of this team for years to come. Aliou Cisse – One of the heroes of the 2002 team, former captain Cisse was appointed after Alain Giresse was sacked two years ago, having been a part of the setup since 2012. Rather wonderfully, Cisse’s backroom team includes three further members of the 2002 squad: Omar Daf, Tony Sylva and Lamine Diatta. In each of Senegal’s 7 matches in 2016, the squad that scored 2 goals has won, with Senegal emerging victorious 6 of 7 times. In Group B, Senegal is projected to finish 1st and advance with an average point projection of 5.40 points. Group B does feature two of the Teranga Lions’ potential boogie teams in Algeria and Tunisia. Dating back to 2014, Senegal is 0-4 against these two with 0 goals scored and 4 conceded. Senegal again find themselves drawn with Algeria. The Fennecs eliminated Senegal from the 2015 edition with a 2-0 win in the final group match. Overall, Senegal has a 1 in 6 chance, or 15.68%, of being crowned African champions. This represents the second highest odds in the field. Group stage exit – In any other group, you would expect Senegal to progress, but this time you have to expect the more established teams around them to go through.